The Mid-Atlantic Road Racing Series (MARRS) held its first regional SCCA Club Racing event of the 2012 season on Saturday April 21st and Sunday April 22nd at Summit Point Raceway in West Virginia. Larry and Ted Cahall practiced on Friday and brother Bob joined them late Friday night for the two days of racing. Ted ran in three classes: SM, SM5, and STL. Bob and Larry each ran only in the SM class. On Saturday Ted qualified 20th out of 32 cars in SM, probably his worst qualifying position in years. His best lap was an anemic 1:30.746 with most of the qualifying session laps in the horrendous 1:32 to 1:33 range. It was not a great start to the race year! He also qualified 3rd out of 5 cars for the STL class and 3rd out of 7 cars in the SM5 class. Larry and Bob qualified 24th and 29th for the SM class. In the Saturday SM Qualifying race: Ted finished 15th, Bob finished 23rd, and Larry 25th. Ted and Bob both slightly improved their fastest lap from the earlier qualifying laps session. 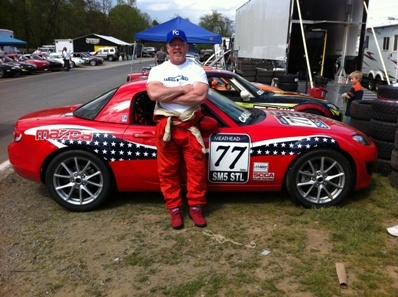 Ted also finished 3rd in STL with a fastest lap of 1:26.213 in the MX-5 cup car (shown above) and 3rd in the rainy SM5 race. In the Sunday feature races, for the SM class Ted, Bob and Larry finished: 13th, 22nd , 25th respectively. It was a rain soaked event with finishing a much higher priority than fastest lap times. For STL and SM5, Ted finished 2nd and 4th with both events also in the rain. As always, a huge thank you goes out to Jimmy, Sherise, Wendy, Karen, Mike Collins and Meathead Racing for their pit crew services!